We welcome Hayley Williams, making her World Footy News debut. 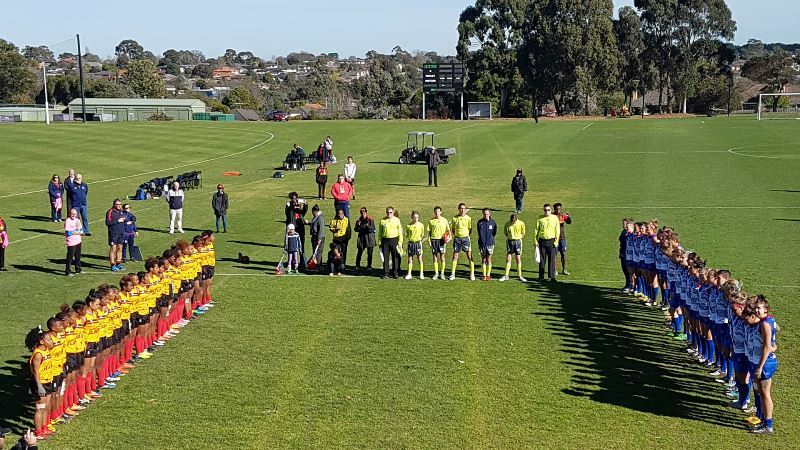 It was a cool but sunny morning at Wesley College, with very little breeze to kick off the match between USA Freedom and PNG Flames. With what was described as perfect conditions from the USA’s team manager Jess Whisney. Thirty minutes was spent by both teams warming up before it was time to show their national pride as they lined up for the national anthems. Captains; Hallie Kastanek (USA) and Prudence Sindriwen (PNG) were invited by the umpires to toss the coin, this saw PNG win the toss and electing to kick to the right of the ground. 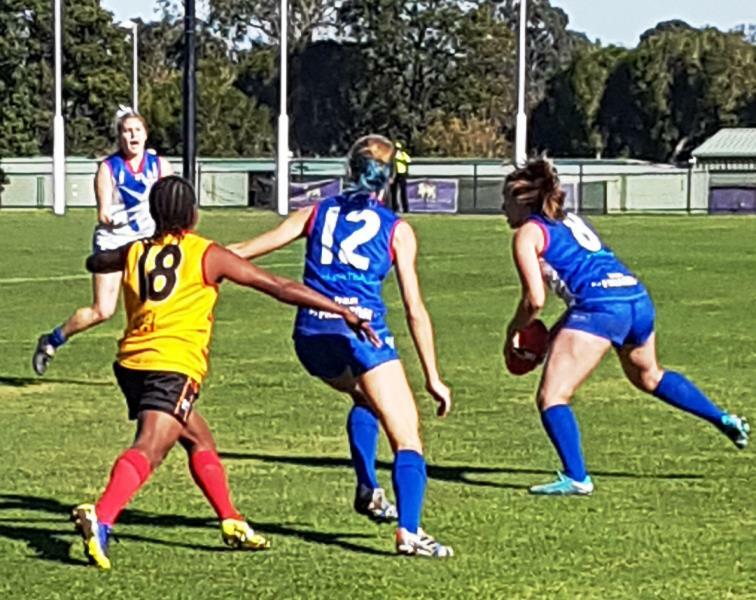 The first quarter nerves were evident from both sides, with previous weather conditions making the ground dewy and the ball proving to be a little slippery and hard to handle once on the deck. USA were dominating play and built a strong defensive wall resulting that ball spent most of first quarter predominately in their forward half. Efficient forward pressure from the USA team resulted in the first goal, an on the run 30m kick from midfielder Katie Klatt (#10). USA controlled the ball very well despite the dewy conditions, targets were nailed and link ups with handballs worked effectively for them. PNG’s style of play was to run and carry, their mentality was to play on at all cost, to try and break the defensive barrier of USA but to no avail, with managing just the one behind to USA’s one goal three behinds. PNG’s game style coming into second quarter, had seen the team play with a lot more intensity, resulting in a free kick paid just outside the goal square, it was a slight angle for Bauwase Maureen (#16) giving her team the first. This was the fast start and lift the PNG team needed, it resulted in a better flow to their game and the confidence boost was obvious with the hit up of more targets. The physical side to their game was also intensified with several big tackles laid on the USA team, but the aggressive style of play also showed the undisciplined side of the PNG team with a free kick awarded to Emily Riehl (#26) and a 50m penalty tacked onto that bought Riehl within range and to which she made no mistake and slotted a 30m goal straight in front. USA had a number of chances in front of goal but unfortunately could not capitalise. After the half time break USA came out in dominant form, holding PNG scoreless for the quarter. Similarly to the first quarter majority of the play was in the USA forward half, with glimpses of good play from PNG with good ball skills and great pick up of the loose ball off the turf. Katrina Scherer (#12) was awarded a free kick 30m out directly in front of goal, as PNG’s frustration showed in their play and became very undisciplined. Whilst Emily Riehl capitalised with her second goal on the run, USA’s captain Hallie Kastanek (#21) was commanding the ruck, leading the hit-out count and giving her midfielders the best opportunity to go forward. Although USA were dominating, PNG never gave up and did not drop off in terms of intensity. The last quarter proved to be the most entertaining as players from both teams hit their stride with skills and execution, with goals to both Brette Brower (#3) USA and Fatima Sovara (#18) PNG. PNG were tackling with pride and force which in turn made USA muscle up as well, with Carly Smolak (#7) laying some of the biggest tackles of the match. 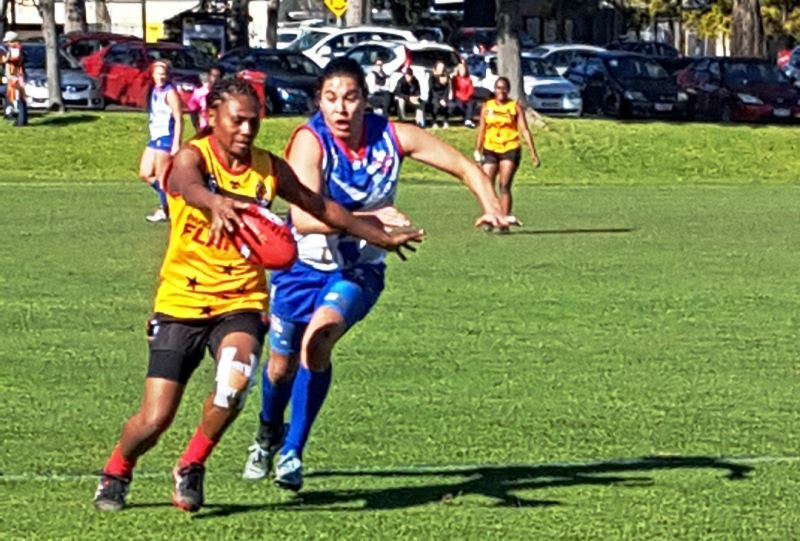 Taiva Lavai (#15) turned the after burners on, on multiple occasions and took on three USA tacklers in the one play to deliver the ball into the forward line for PNG. 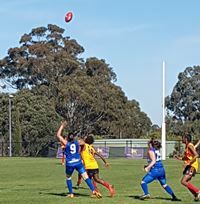 This is when the ‘almost play of the day’ occurred with PNG’s Vanessa Pisep (#14) attempting a snap out of the pack, deep in the forward pocket and whilst it was curling back, it just shaved the inside of the goal post. Fans from both teams all let out sighs and groans of disappointment, as it would have been a truly remarkable goal at the end of the match.